The Most Rev. Francisco Manuel Moreno, Archbishop of Mexico and Bishop of Northern Mexico. 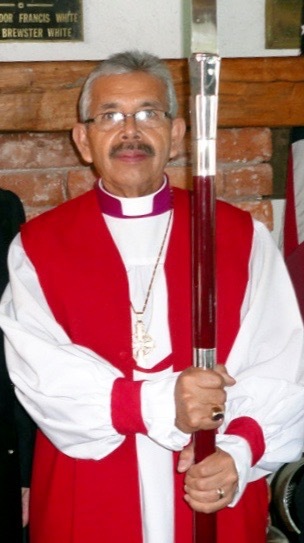 Archbishop Moreno was elected archbishop and primate of the Anglican Church of Mexico at the church’s seventh General Synod on 14 June 2013. Born 13 August 1950 in Monterrey, NL, he was reared a Roman Catholic but entered the Anglican Church as a teenager. Educated in Monterrey, he trained for the ministry at San Andres Seminary in Mexico City and was ordained deacon in 1975 and priest in 1976 for the Diocese of Northern Mexico. He served as a youth minister, parish vicar and non-stipendiary priest until his election as bishop. He is married to Esperanza Neuvas and has three children and three grandchildren. Archbishop Moreno underwent abdominal surgery in December 2015 and is not expected to be able to attend the January 2016 primates gathering in Canterbury.